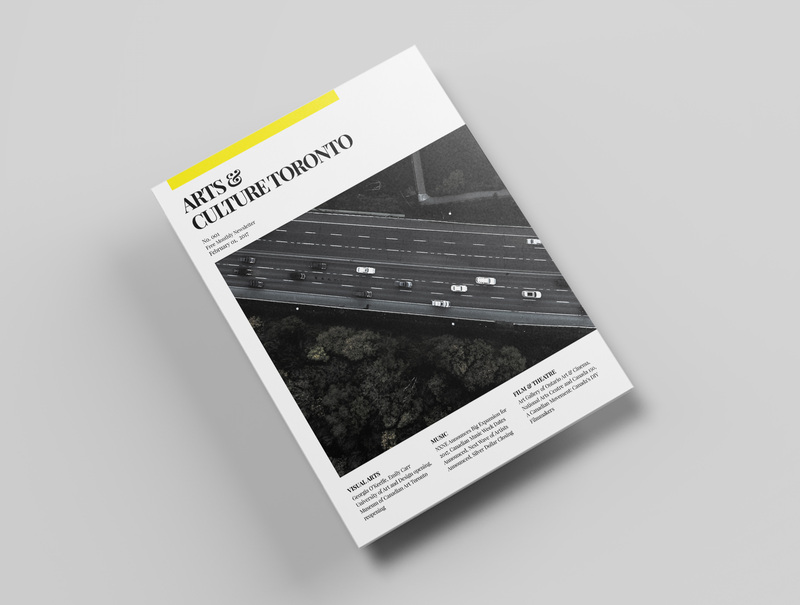 Arts & Culture Toronto is a contemporary weekly newsletter that focuses on events and news involving the arts in Toronto. The target audience ranges from 20 to 50 year old Torontonians interested in film, theatre, music, and visual arts of all social classes and genders. The newsletter is designed as a lightweight alternative to newspapers as a way to inform those interested in the arts with the most current and relevant information regarding museum exhibits, film events, as well as theatre and music festival information. I wanted to keep the content clear and easy to read while also introducing elements of colour to draw the reader’s eyes through each article. 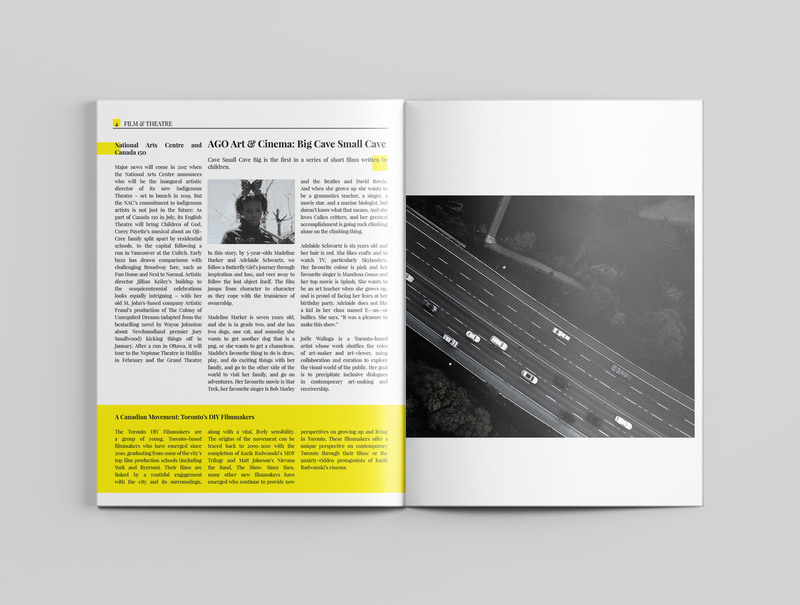 Keeping the photos in black and white helps to keep the reader focused on what they’re reading as well as unifies the design of the newsletter. The newsletter template consists of five pages — a cover showcasing a weekly featured photograph or other display of art, a page dedicated to visual arts, one for music, another for film and theatre, and lastly the last page for a fuller display of the cover photo with credits to the artist. 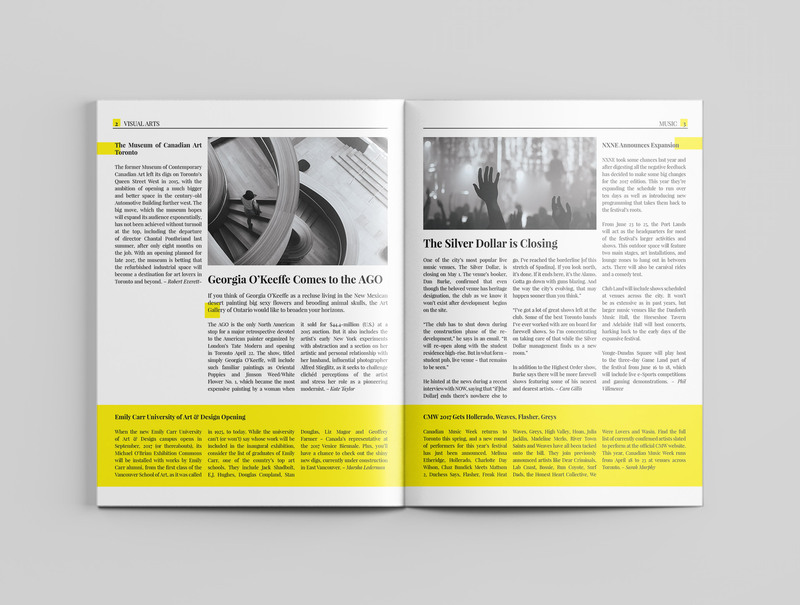 Keeping the newsletter short is vital to its longevity as it’s less expensive to produce with less pages, and being a weekly newsletter means it doesn’t need as much information in each issue. CMW 2017 Gets Hollerado, Charlotte Day Wilson, Weaves, Melissa Etheridge by Sarah Murphy, Exclaim!